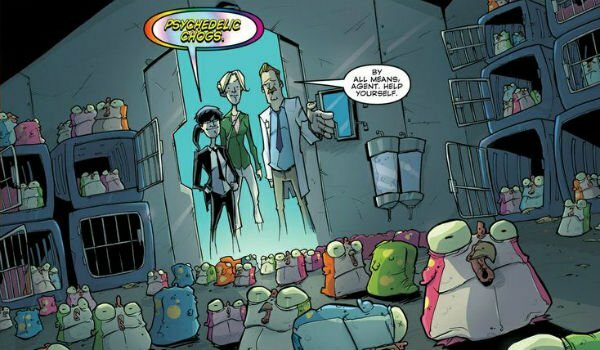 What is turning out to be a nerd-dream come true, former Doctor Who star David Tennant has now joined Felicia Day as well as Walking Dead star Steven Yeun for an animated adaptation of the critically-acclaimed Image Comic, Chew. The part, which was originally going to be filled by Robin Williams, will now be voiced by the fan-favorite Doctor. According to The Hollywood Reporter, Tennant joins already cast Steven Yeun and Felicia Day as the center love interests in the story. Tennant will be voicing a critical character, Mason Savoy, a mentor-turned-villain. The story of Chew for those unfamiliar centers around a FDA detective named Tony Chu (voiced by Yeun) who has a very special skill set. Tony is a cibopath, a person who gets psychic impressions from whatever he eats. The best way to describe this is by imagining Tony takes a bite of a chicken, from that small bite he visualized the chicken being born, the farm he was raised on, all the way up to the butcher who slaughtered him. It’s a vivid gift that unfortunately doesn’t allow Tony to enjoy food much, but does help him to solve a number of crimes (often by cannibalism). But then Tony meets Amelia (voiced by Day) who is a saboscrivner, a person who can write about food so vividly that people can actually get physically ill from her descriptions (when bad). This obviously attracts Tony considering reading her work is the only time he’s ever actually ‘tasted’ anything. We aren’t sure what story line the animated series is going to take. There’s been about 49 issues out as of may, and tons of strange things and side storylines are explored. Yeun and Day have already recorded their parts last year, so Tennant is currently working on his this week. The project was stalled last year due when Robin Williams a huge fan of the comic book series, unexpectedly committed suicide. The popular comic will be adapted by director Jeff Krelitz, who also helmed the animated Torchwood: Web of Lies and Peter Panzerfaust. And if the animation holds any resemblance to the artwork of the comic book drawn by Rob Guillory, we are in for quite the bizarrely beautiful treat. No word yet on an official release date.